Karawang – PT. Toyota Motor Manufacturing Indonesia (TMMIN) today celebrates the opening of its new Karawang Engine Plant in a ceremony attended by Minister of Industry of the Republic of Indonesia Saleh Husein, Head of Indonesia Investment Coordination Board Franky Sibarani, Governor of West Java Ahmad Heryawan, Toyota Motor Corporation (TMC) Senior Managing Officer (SMO) K. Saga, TMC SMO M. Kawai, President Director PT. Toyota-Astra Motor (TAM) and TMC Managing Officer (MO) H. Fukui, President Director TMMIN M. Nonami, and Vice President Director TMMIN Warih Andang Tjahjono. The new plant is producing aluminum based gasoline engine R-NR for passenger cars with production capacity of 216,000 units per year with an investment of 2.3 trillion Rupiah (USD 170 million). “I am very happy to say that our new Karawang Engine Plant is one of the most advanced Toyota Engine Plant in the world, equipped with the latest design and technology. The engine its produces, R-NR, is also part of TMC new engine line-up and will be exported to countries in Asia. The plant, the engine, and the export are a part of our commitment to continuously contribute to the development of Indonesia automotive industry in particular and Indonesia economy in general,” said TMMIN President Director M. Nonami in his greeting. 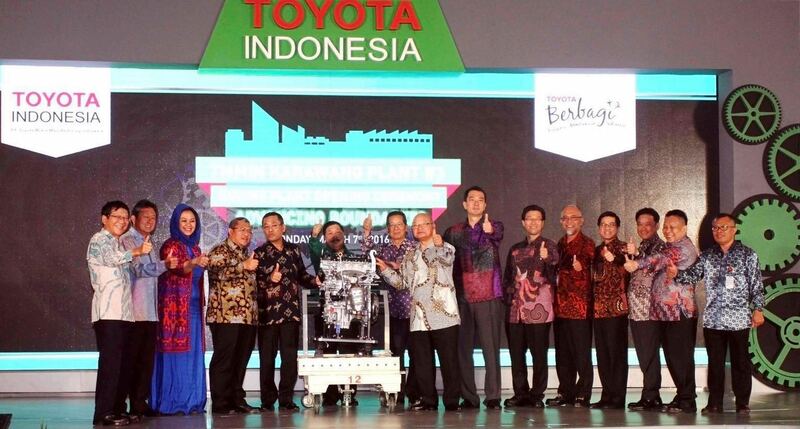 TMMIN’s new Karawang Engine Plant is designed as a modern plant with latest technology to reach high efficiency and is a part of global Toyota efforts to build competitive plants. It is the first Toyota Engine Plant in the world to adopt “Through Line” concept which is implemented from Toyota Production System where it would shorten lead time and decrease stocks in production by having all production process under one roof. The Karawang Engine Plant is also build with environment consideration in mind. The implementation of Inorganic Sand Core Binder (low combustion temperature and shorter process time) and High Efficiency Burner in Karawang Engine Plant for example would contribute significantly to the lowering of energy usage in production process. It wills also resulting in odor free casting process. The 1.3L and 1.5L R-NR engine produces by TMMIN Karawang Engine Plant boast a local content level of 80%. The local production involves 12 new first tier suppliers, making the total of TMMIN’s first tier supplier to 135 companies from previously 123 companies. “We are working very hard with our current and new suppliers to increase the local content of Toyota Indonesia products, may it be engines or vehicles. In November last year, we raised our Kijang Innova local content to 85% followed by Fortuner to 75% earlier in January, and now R-NR engine initial level is at 80%. We will continue our efforts in increasing these levels further by focusing on upstream localization,” said TMMIN Vice President Director Warih Andang Tjahjono. Toyota Indonesia exports R-NR engine with destination of 5 countries in Asia region. In 2016, approximately 79,000 R-NR engines will be exported. The trust given to Toyota Indonesia to export R-NR engine strengthen Toyota Indonesia position as one of Toyota global production and export base for vehicle and engine in Asia-Pacific. “Toyota positioned Indonesia as a key production and supply base not only for vehicles, but also for engine. We have been doing business in Indonesia for near to 45 years now and we have every confidence in the operation here to cater demands from domestic and global automotive market,” said TMC SMO K. Saga. Toyota Indonesia has been exporting TR gasoline engines to 12 countries in Asia, Africa, and Latin America. In the past 5 years, approximately 51,500 TR engines are exported annually. Meanwhile export of Toyota brand vehicles was started in 1987 with the 3rd Generation of Kijang to countries in ASEAN and Pacific. Last year, export of Kijang Innova, Fortuner, Vios, Yaris, Avanza, Rush, and Agya to countries in Asia, Africa, Latin America, Middle East, and Pacific reached 176,700 units, the highest achievement for Toyota Indonesia to date. In line with Toyota Indonesia philosophy of “We make People before We Make Product” as the core value of our company, TMMIN develops and operates a new TMMIN Learning Center (TLC) in the complex of Karawang Engine Plant with the task of developing TMMIN employee in engine production. Within this facility, both hardware technology such as machineries and human technology such as knowledge and skills are taught. It is equipped with certified trainers, class rooms, and simulation rooms. This 3rd TLC required an investment of 23 billion Rupiah (USD 1.7 million). Two other TLCs focusing on vehicle production training have been operated at the premise of TMMIN Sunter Plant and Karawang Plant 1 & 2 since 2012. They are also utilized as training grounds for suppliers and surrounding education institutions. “The new TLC would contribute to our aim in developing world class people that able to maintain and continuously improve our world class standard products. We open our TLC to suppliers and education institution to match our vision of Toyota Learning Center as an important part of TMMIN involvement in efforts to develop human resource in Indonesia, especially in manufacturing skills,” said Nonami. Last year, TMMIN started operation of Toyota Indonesia Academy located next to the new Karawang Engine Plant. This academy is entrusted to develop selected vocational school graduates for 1 year in the study of automotive manufacturing. Students will learn a combination of basic studies, technical skills, and industrial culture and characteristic. A total of 32 students coming from every corner of Indonesia are currently set to become the first graduate of this academy by the end of this year. Toyota Indonesia is also active in corporate social responsibility (CSR) in the field of education. The Toyota Eco Youth (TEY) program is an environmental improvement contest for High School student that enter its 10th year in 2016. TEY aim is to build young generation way of thinking and initiative of the students. Another CSR program is Toyota & Astra Foundation. Active from 1974, the foundation supports the development of Indonesia's human resources through a number of activities, from the distribution of scholarships for all level of education to donation of automotive education tools. On top of these two activities, Toyota Indonesia also routinely conduct knowledge and skill sharing to Vocational School and Universities through trainings, lectures, and donation of Lean Production System Laboratory.